On a Golf Course ''flag'' Cul-De-Sac Lot within the Gated Talus Community of Troon North. Also Privately Gated as you stroll down its 50 yard of tree-lined driveway ending in a circular drive and dancing fountains. 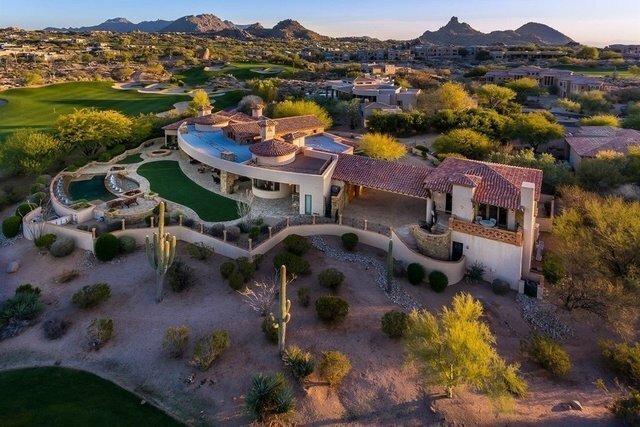 At the peak of 2 fairways, find this Timeless, Old World Style Residence built around capturing the views and vistas virtually from every direction. Builders personal home, built with masonry block construction and 2X6 metal framing and fur out - 2'' sprayed foam insulation. Grand Entrance, single level living and open floor plan living, 6 fireplaces, royal style master with hearth, mantle and decor niches, Crestron controlled, enclosed microwave & fridge; his/her vanities and dressing table, Thermasol steam shower and jetted tub are at your leisure. Gourmet Kitchen with Full view windows, soft white oak cabinetry with rain glass fronts, slab granite carved counters, Gaggenau steam oven, Viking 60" cook-top, double viking ovens, Viking refrigerator & freezer plus 2 Sub-Zero refrigerator drawers, Sharp micro drawer, Miele plumbed in coffee maker, Fisher Paykel dishwasher drawers plus a full size dishwasher, vegetable sink, trash & recycle cabinets, appliance garage and toe kick dust pans. Home offers a climate controlled wine cellar, game room, home theater with bar and stand seating recliners. Expensive Patio living space, to include 3 heaters, 2 fireplaces, full outdoor kitchen, pool and spa. The Guest house contains all of the quality and detail found in the main house, kitchen, living room, bedroom, bath and fireplace both inside and on the balcony as well as private laundry. The garages spare no detail, sized for 6 cars leaving plenty of elbow room. Main garage is air conditioned, with numerous storage and work rooms at same level of quality as you would find inside the home. At R-55 rated insolation, expect lower cost utility bills with 8 zones HVAC units! Wood framed windows and doors throughout, mosaic inlays, detailed plaster work and faux finish decor painting throughout. Not to be missed; MOTION VIDEO and feature sheet with this listing.